Houston janitors fought like hell to get from $8.35 an hour to $9.35 an hour—over four years—cleaning the offices of billionaires. 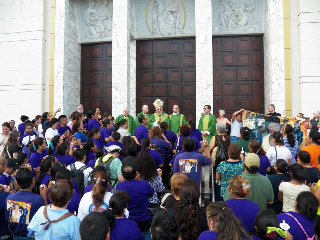 Last week, more than 3,200 janitors in Houston called an end to their five-week strike. The cleaning contractors initially offered a total wage increase of $.50 an hour phased in over five years—so in 2016 the janitors would earn $8.85 an hour. The janitors asked for a raise to $10 an hour over three years. In the end, the janitors accepted $9.35 an hour over four years, a 12 percent increase over their current pay. They also fought off an effort by the contractors that would have allowed them to underbid the union wage when competing against non-union shops. It is distressing (though not surprising) that the janitors had to sacrifice to such an extent just to gain a raise of twenty-five cents an hour for four years. Houston is “Millionaire City,” after all, having added more millionaires to its population than any other city in the United States for two years running. These janitors sanitize the bathrooms and workspaces, empty the trash and vacuum the floors of some of the largest and most powerful corporations in the world: JPMorganChase, Shell, ExxonMobil, Chevron, Wells Fargo, KBR and Marathon Oil, to name a few. They do their work in the best-performing commercial real estate market in the US in terms of demand. Many in this predominantly female workforce literally have to run to clean more than 100 toilets in five hours each night. 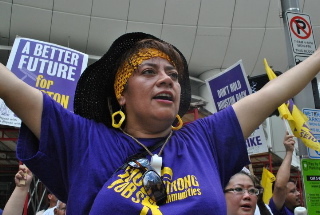 Prior to the strike, the janitors earned about $8,684 annually. In four years, when they see their full raises, they will be paid about $10,000 annually. This isn’t to say that what the janitors achieved isn’t significant and—more importantly—worthy of attention and great respect. They successfully organized in a right-to-work-state with a 3 percent private sector unionization rate. Texas is tied with Mississippi for having the highest proportion of minimum-wage jobs in the nation, and one in five people working in Houston makes less than $10 an hour. Despite this anti-labor environment, over 500 workers went on strike, some were locked out and seventy-four were arrested in four civil disobedience actions. David Madland, director of the American Worker Project at the Center for American Progress, agrees that this win for the janitors is a significant one. He points to declining median wages, high unemployment and low unionization that all result workers having very little leverage. Madland’s recent report, Making Our Middle Class Stronger—35 Policies to Revitalize America’s Middle Class, includes policy recommendations to create jobs; to raise standards from the bottom; and to make basic goods like housing, healthcare and education more affordable. The janitors in Houston are now determined to now play a role in raising the labor standards for other low-wage workers in the city. SEIU plans to organize airport workers (who often work below minimum wage), as well as Houston’s security guards and food service workers. Beyond efforts to organize assist other workers in organizing their workplaces, the janitors are involved in broader campaigns to protect Medicaid and fight wage theft. “This is a small but significant win that low-wage workers can hopefully build on to make major change in the Houston labor market,” said Madland. I’ve had the opportunity this year to get to know many participants in Witnesses to Hunger—a project in which people living in poverty use photographs and testimonials to advocate for change at the local, state and national levels. Tianna Gaines-Turner is a Witness and a friend living in Philadelphia with her husband and children. She works at Drexel University’s School of Public Health and as a homecare worker for an elderly person. I spoke with her this week about what she’s been seeing since Pennsylvania eliminated its General Assistance program and nearly 70,000 disabled people lost their sole source of income. Our conversation led to a much broader discussion about the need to change how society perceives and helps people who are struggling. One of Tianna’s projects through Drexel is operating a “Witness-to-Witness” peer mentoring program two days a week, open to anyone. She helps people get the food, energy assistance, healthcare, school supplies, community legal services and housing services they need. Legal aid lawyer Michael Froehlich of Community Legal Services in Philadelphia told me he is also seeing a marked increase in desperation. In recent days, Tianna has worked with a newly homeless young man, who—when asked where he wanted to be in five years—said, “I don’t want to be dead or in jail.” She also spoke with a young woman and her partner, who both work, are raising their five children, and caring for her parents. They didn’t know how they could continue to take care of the woman’s mother, who now has cancer. Part of protecting herself involves running a “Safety, Emotions, Loss and Future” (SELF) group on Thursday mornings that many of her Witness sisters also participate in. The SELF group is also confidential and open to the public. The work Tianna is engaged in definitely makes her angry at the way low-income people are being portrayed in the current political climate. Good news: the Obama campaign has said it will soon respond to the first five questions—from Peter Edelman—in TheNation.com’s new “Talk About Poverty: Questions for Obama and Romney” series. Not too much luck with the Romney campaign so far, but we’ll keep trying. So keep tweeting, #TalkPoverty. And thanks—because the only way we get them to talk poverty is if we demand that they talk poverty. Congratulate Candy Crowley & Join the Debate! “How Raising the Federal Minimum Wage Would Help Working Families and Give the Economy a Boost,” Doug Hall and David Cooper, Economic Policy Institute. Increasing the federal minimum wage from $7.25 to $9.80 per hour would give more than 28 million workers a raise while generating approximately 100,000 new jobs over three years. Hall and Cooper show that the raised wage would generate almost $40 billion in increased wages for workers still reeling from the effects of the recession. “The Economic Impact a Minimum-Wage Increase Would Have in Your State,” Economic Policy Institute. “The Crisis Continues: Pennsylvania’s Medicaid Program Draws National Scrutiny Over Children’s Enrollment Plunge,” Pennsylvania Partnerships for Children. Pennsylvania’s Medicaid enrollment has declined by 91,400 children in just ten months. The federal government has asked Pennsylvania’s Department of Public Welfare (DPW) to explain the Medicaid eligibility procedures it has been using in recent months, writing that “it appears that it may have been improper to terminate Medicaid coverage” in a number of cases. DPW has not responded to date. This Week in Poverty previously reported on the state’s irresponsible actions with regard to children and Medicaid here. Community Action Partnership’s 2012 Annual Convention (August 19–22 at the Hilton New York). More than 1100 human services professionals from Community Action Agencies serving low-income communities across the country will attend. The convention features 100-plus workshops focused on a variety of topics affecting low-income individuals, including: job creation, housing and homelessness prevention, Head Start, economic development, and asset building. If you can’t be there, you can follow @CAPartnership and #PartnershsipNYC. 50 percent of the jobs in the US pay less than $34,000 a year (Economic Policy Institute). 25 percent of the jobs in the US pay below the poverty line for a family of four, less than $23,000 annually (Economic Policy Institute). Median wealth, single black women: $100. Median wealth, single Latino women: $120. Median wealth, single white women: $41,500. Poverty rates for minorities: approximately 27 percent of African-Americans, Latinos and American Indians, versus 10 percent of whites. Number of children in poverty receiving cash aid: one in five. Children under age 5 in female-headed families in poverty: 58 percent (US Census Bureau). Total number of US children under age 18: 72 million. Number of US children in low-income families (less than $44,700 for family of four): 31.9 million. Twice the poverty level (less than $44,700 for a family of four): 103 million people, roughly 1 in 3 Americans. Employment rate for people with disabilities, 2010: 18.6 percent. Employment rate for people with no disabilities, 2010: 63.5 percent. People ages 50 and over at risk of hunger, daily: 9 million. This Week in Poverty posts every Friday morning. Please comment below. You can also e-mail me at WeekInPoverty@me.com and follow me on Twitter. 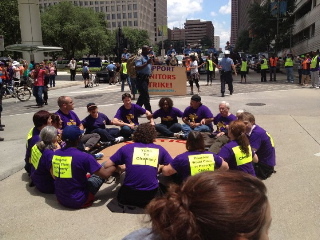 Images of Houston janitor strikers courtesy of Izabela Miltko. 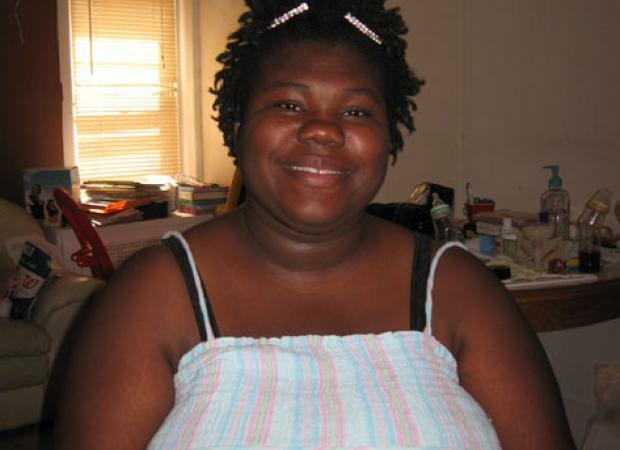 Image of Tianna courtesy of Tianna Gaines-Turner, Witnesses to Hunger.